Galway East Tourism - Athenry Self Catering Cottage in East Galway, West of Ireland.Galway East Tourism - Athenry Self Catering Cottage in East Galway, West of Ireland. This self catering cottage is ideally located in the west of Ireland in a tranquil country setting where you can get a taste of real Irish countryside. This cottage is at the end of a cul de sac on a country lane and close to all the amenities that Athenry has to offer and just a 20/25 minute drive to Galway city. There is little or no traffic along this lane so it makes for a safe environment for leisurely walks enjoying the local countryside and also a worry free environment for parents. 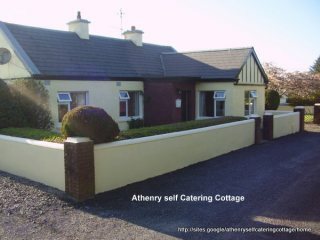 Athenry Self Catering Cottage was fully refurbished and modernised internally in 2007 to give all the comforts and facilities one expects to find in a quality holiday home. Athenry golf course and Loughrea lake are just a short drive away. The cottage is also close to a Par 3 pitch & putt course in Esker Monastery. Athenry can be used as a gateway to the west of Ireland. The town itself is a heritage town with many historical sites. Galway city, the Galway races, the Galway arts festival and the Oyster festival are easily accessible as is Connemara and the Burren in Co. Clare. Athenry Self Catering Cottage, a perfect base for unwinding and discovering Co. Galway and the west of Ireland. Enjoy the many historical sites of Athenry and the busy cultural and extensive shopping of Galway city. Three bedrooms which sleep six people. Kitchen appliances consist of fridge/freezer, washing machine, dryer, gas cooker, microwave, kettle and toaster. Oil central heating, Hot water emersion, a pumped power shower and an additional electric shower. There are 2 tv's with dvd's and 8 tv channels (4 Irish & 4 UK channels), A cd player/radio is also available. The cottage is on a spacious plot and has a driveway to the rear, there are gardens to the front,side and rear. There is an outdoor eating area with seating and a barbecue adjacent to a childrens play area which has toys for smaller children. The cottage also has a garden shed for your storage purposes. Please visit our website for video presentation and more details of the cottage and Athenry area.